This semolina bread with apricots and sage is a wonderful combination of sweet and savory. The apricots add a sweetness and the aroma of sage totally reminds me of Thanksgiving. 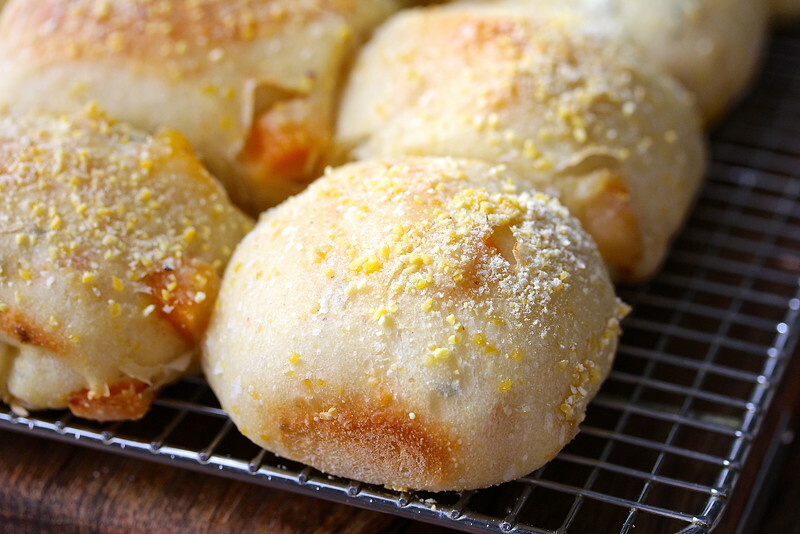 It's a wonderful bread for breakfast with butter and honey, or even some melted cheddar. It's also amazing with soup. The majority of the flour in this bread is semolina, which behaves very differently than all purpose or bread flour. It is yellow in color, and its gluten is much more delicate than traditional wheat flour. It is slightly sweet and nutty in flavor, but still very mild. This dough also contains cornmeal, which adds a bit of crunch. The texture of the bread resembles that of muffins or corn bread. It's actually kind of cake-like. It's also totally tasty. With the fragrant sage, I seriously want to try using it instead of cornbread for turkey stuffing. This recipe makes three pounds of dough, which can be shaped however you like. The original recipe calls for three flattened boules that are cut, twisted, and shaped into pretty sunflowers. Instead, I divided the dough into 18 pieces, formed them into balls, and and nestled them into two 10 inch square cake pans. If you squint, you can almost see sunflowers. That's my story and I'm sticking to it. After the recipe, check out what the rest of the #BreadBakers baked for this month's theme, stone fruit, chosen by Mireille of the blog, The Schizo Chef. Thank you Mireille! In the bowl of a stand mixer, stir the yeast in the water to dissolve. Let it sit for about 3 minutes. Add the flour, and mix with the paddle attachment on low for about a minute. Place it into a container and let it rise for 6 to 8 hours, until it has more than doubled. Use the biga while it is still growing and is not deflating. You can retard the biga by letting it rise at room temperature for an hour, refrigerating it overnight, removing it, and letting it sit at room temperature for three to four hours. 400 grams (1 3/4 cups) biga. Use all of the biga in this recipe. Place the diced apricots into a shallow bowl and cover with just enough water to reach the top of the apricots. Set aside. Add the water and yeast to the bowl of a stand mixer. Add the biga to the water and yeast mixture and stir with your hands to combine and break up the biga. Add the flour, corn meal, and salt, and stir with a dough whisk or your hands to fully moisten the dry ingredients. The dough should be sticky. Knead on low with the dough hook for about 5 minutes. You can also knead by hand for about 5 to 8 minutes until smooth. Cover the bowl with plastic wrap and let rest for 20 minutes. Take the dough and spread it out into a large rectangle and sprinkle the apricots and sage over the top. Press them into the dough. Fold the dough over itself in thirds, like a letter. Then fold the dough in half to create a square. Pat the dough down and continue to fold the dough until the apricots and sage are incorporated. Form the dough into a ball, and place it into an oiled bowl, cover, and let rise for one hour. Gently deflate the dough and fold it over itself from the left and right "sides." Then shape the dough into a ball, cover, and let it rise for another hour, until doubled. 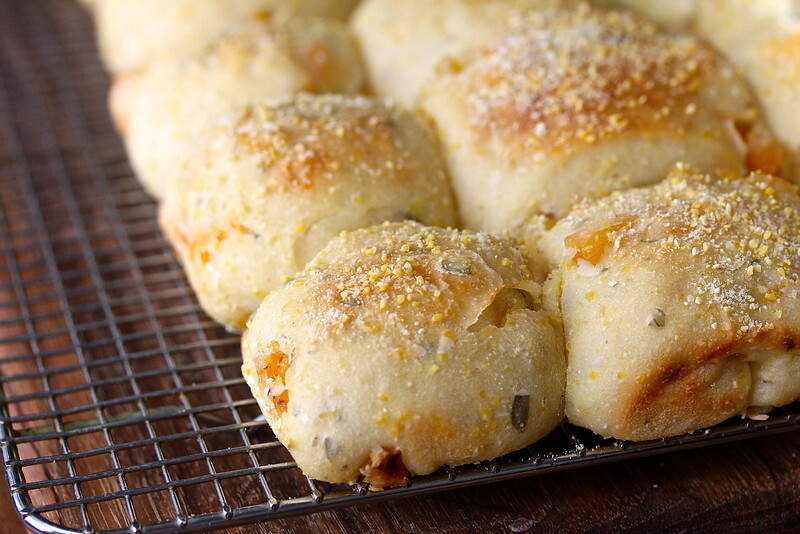 Divide and shape the dough however you prefer, into boules, loaves, or rolls. I divided the dough into 18 pieces, shaped them into balls, and baked them in two 10 inch square cake pans (9 pieces per pan). Sprinkle generously with cornmeal. Cover with plastic wrap and let rise for 45 minutes to an hour. Preheat the oven to 425 degrees F. Place a steam pan on the lowest rack and, if you have a baking stone, place it on the middle rack. Bring 1 cup of water to a boil. Place the loaves or pans on the baking stone (or the oven rack) and pour the boiling water in the steam pan. Be sure to cover your oven window with a towel when pouring the water into the pan. Remove the towel, close the oven door, and bake for 10 minutes. 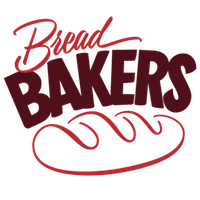 Reduce the oven temperature to 375 degrees F and bake for another 15 to 20 minutes, until the bread reaches an internal temperature of 210 degrees F. De-pan and cool on a wire rack. Oh yes, I can totally see the sunflowers. Ha! I'd have to pass on shaping it into sunflowers too. I think making rolls with it is much better. I totally see the sunflowers, lol! Seriously, these rolls look fabulous. Interesting info on semolina flour. I have some, but hadn't realized it would be different from regular wheat. I bought it to make pizza dough, but somehow forgot I had it until I saw your post! Thanks Susan =) I've had my share of failures with it too, but it tastes really good, so I keep coming back. Pass me a roll and some butter please! Would love to break bread with you! Wow Karen! This bread is beautiful! I think I will adore the texture. And the sage makes this bread so unique. LOVE IT! Oh so pretty! No need for sunflower shaping. What you've done is just right. I love seeing rows and rows of rolls as they bake together. Ha ha I too can see the sunflower!! I too prefer rolls for shapes, what if I don't allow anyone to eat my pretry looking bread 😂!! Rolls look utterly cute!! Beautiful breads! They look great and I really like the addition of sage. Thanks! It's a good contrast for the apricots. Oh I love sage. I never would have thought to pair it with apricots. Genius. These rolls look so amazing! Exactly! Thanks so much Sharanya! 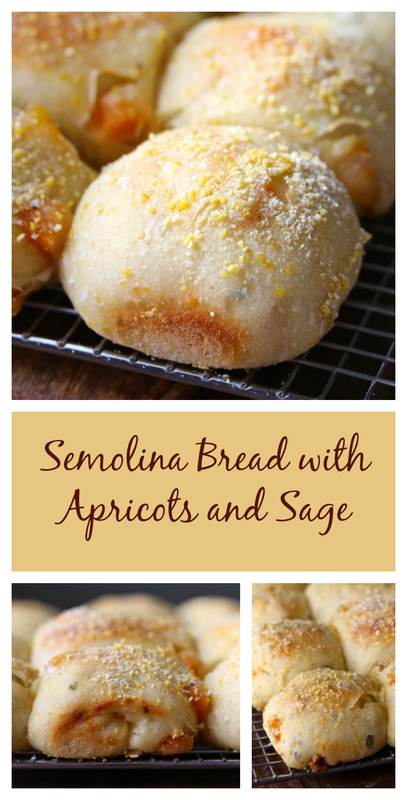 Semolina is one of my favorite flavors. That is such a beautifully baked bread. LOVED the addition of apricots and sage in there. Your apricot and sage combination sounds really good, I like experimenting with different flavour combinations.